Fall has officially started and we have a ton of events and beer coming your way this October. We have a new Specialty Pizza for the month of October, an art show, an event with Enegren Brewing Co. and a Halloween Party at the end of the month. Start finalizing your costume ideas and continue reading below to save the dates! If you haven’t read the latest news about IAC expanding click here to read our blog. Don’t forget to add us on our new Snapchat account: @institutionales, and use our geofilter when you're at the brewery. Tag us in your best IAC pictures! This month's specialty pizza is Lasagna! This Italian-inspired pizza has ground pork and sausage with zucchini a three cheese blend of ricotta, mozzarella, parmesan, fresh chopped basil, garlic and our house made marinara sauce topped with parsley. It is a cheesy, saucy and savory dish that pairs great with our Red IPA, Static or our Maple Brown Ale, Restraint. Starting this October IAC will be hosting a new event each month titled Lockdown. Lockdowns will happen once a month and feature a special guest brewery and their favorite beers on tap at IAC. To kick off our first Lockdown, Enegren Brewing Co will be here on October 25th to hang out and pour some of their brews! 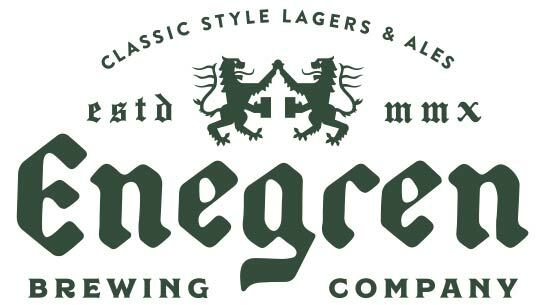 Enegren will be bringing by some of their amazing lagers, including their Oktoberfest! Grab a pint or get a flight of all of four Enegren beers on tap. In honor of fall, we're bringing back our Red IPA, Static. Crystal malts give this beer a ruby red color and give hints of toffee and caramel, complementing the fruit-forward hop flavors. Though maltier than our traditional IPAs, this beer still finishes dry and crisp. One of our most popular beers has disappeared from the taps, but thankfully only temporarily. Our White IPA brewed with 100% Citra hops and White Wheat will return this week. Our Mosaic and Amarillo hopped double IPA will be returning! Be on the lookout for this super fruity and bitter DIPA! We added toasted cocoa nibs and coffee to our staple brown ale. This decadent version of Restraint will also be served on nitro. This beer will be a limited release, so make sure to keep tabs on social media to grab a pint before it's gone. Our fall seasonal, Ratched, will return in the middle of the month. Ratched is a rye porter brewed with a medley of dark and caramelized malts. Ratched is medium bodied and semi-sweet with chocolate and coffee notes. A new IPA recipe, brewed with old school hops - Centennial, Columbus and Chinook hops. Classic West Coast bitterness and a citrusy hop profile. This is Clarity with peppers added - medium spiciness, and big pepper aroma. This is a small batch so stay connected on social media to find out when it gets tapped! This month we're tapping Pumpkin Restraint. This is our maple brown ale brewed with pumpkin spices - cinnamon, nutmeg, ginger, allspice and vanilla. It's one of our most popular beers and will return just before Halloween. Double IPA brewed with White Wheat. A super fruit forward DIPA thanks to double dry hopping lead by Mosaic hops. Just in time for Halloween! Scary Dairy is our imperial milk stout dosed with loads of cocoa nibs and vanilla beans. It's full-bodied, decadent, and most importantly, delicious. Here's what's on tap currently in the tasting room as of October 1st. Gamut-Earl Art show (Thursday, October 12th): We're hosting an art show at the brewery from 6pm-9pm on October 12th! We're going to have live music by Brother Earl and Bad Leaf who will be playing outside on the patio. We will also have a ton of local artists showcasing their work. Artists include Simon Chisum, Patrick Fisher, Marion Wood, Adrienne Durazo, Mouse Rawk, Devin Sullivan & more! Come on over and enjoy the evening with some cool art, music and beer. Chief in Confinement: Topa Topa x Institution collaboration! We will be hosting 3 events with our friends from Topa Topa this October. All the events will be a keep the glass night if you buy a pint of our special collaboration beer called Chief in Confinement. Chief in Confinement is our White Walls base beer, dry hopped with Topa Topa’s Chief Peak dry hop regiment. Ojai Deer Lodge (Friday, October 13th)- The first event will take place at the Ojai Deer Lodge from 7pm-11pm. We will be pouring Mosaic, Virtue, Ratched, Static and Chief in Confinement! Plus Topa Beerssss! There will be live music starting at 10pm by Char-man. Saloon BBQ Co. (Friday, October 20th)- The second event will take place at the Saloon BBQ Co. in Ventura from 7pm-10pm. There will be 4 IAC beers and 4 Topa Topa beers plus Chief in Confinement. Live music will start at 9pm by Sweet Reaper. El Rey Cantina (Friday, October 27th)- Our last event in this series for the month of October will be held at El Rey Cantina in Camarillo from 7pm-10pm. There will be 3 IAC beers, 3 Topa Topa beers plus Chief in Confinement. Live music will be by Noble Grizwald starting at 9pm. Lockdown (Wednesday, October 25th): Featuring Moorpark's Enegren Brewing Co. Enegren will be hanging out at IAC and pouring some of their favorite beers! Enegren will pour some of their amazing lagers, including their Oktoberfest! Grab a pint or get a flight of all of four Enegren beers on tap. Join us from 5pm-10pm! IAC Halloween Party (Tuesday, October 31st): Save the Date! We're hosting a Halloween party on the 31st of October. Come dressed up in your best costume as we will have a costume contest, games and specialty casks! Most importantly, Scary Dairy will also be released on this day so come thirsty!